So, you find yourself stranded in the wilderness. You are not sure where you are, or if anybody is searching for you. You start to look around and wonder what you should do to stay alive until a rescue party finds you. 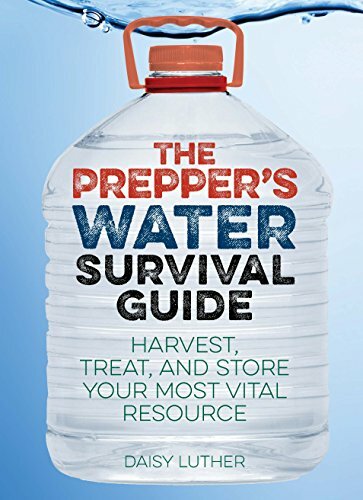 While it looks impressive to see survivalists build elaborate shelters or hunt for food on television, knowing water purification methods is one of the most important pieces to staying alive in this situation. There are four pillars to survival in the wilderness. These are food, water, fire, and shelter. You can survive three weeks without food, three days without water, and in some conditions only three hours without warmth from fire or shelter. Of course, you will want to build a fire or shelter quickly. However, you must stay hydrated to complete the arduous work required for these tasks. In some climates, you can become severely dehydrated in just an hour or two if you do not hydrate. In my very first survival experience, I started working on a shelter around 10 am. By 3 pm my arms were cramping up from dehydration and I could no longer work. Unfortunately, salt water is not potable and most of the fresh water on the planet is teeming with bacteria and parasites. Water must be purified in order to drink it safely. 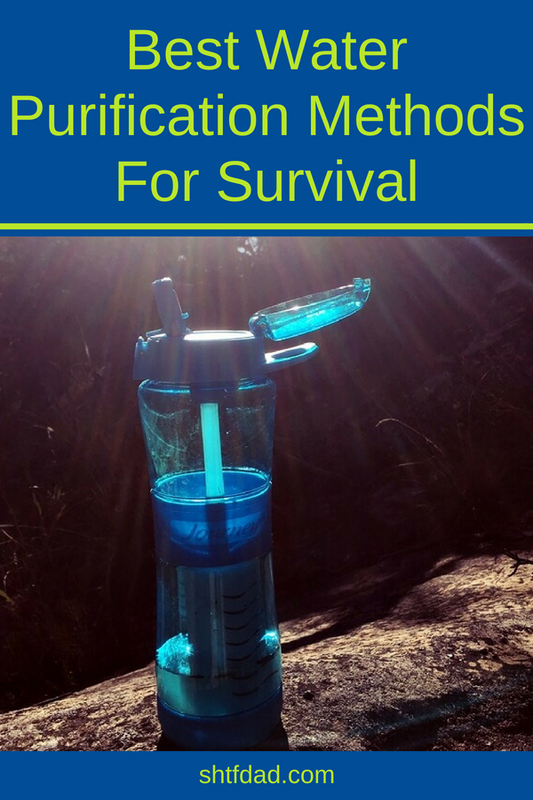 Why Are Survival Water Purification Methods Important? While there are situations in which it is better to drink tainted water than to die from dehydration, it should be avoided whenever possible. Drinking dirty water can give you all kinds of waterborne illnesses that cause nausea, fever, vomiting, weakness, and diarrhea. All of this can leave you more dehydrated than you would have been in the first place. In addition, some of these illnesses can become life-threatening. It is simply not worth the risk when the water purification process can be so simple. 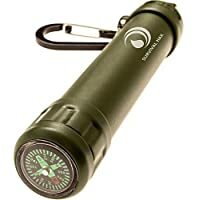 You just need to have a little knowledge and a few supplies with you before you ever head out into the wilderness. Unfortunately, not all water is created equal. You will have some choices in a wilderness survival scenario, so pick the water that is going to be of the best quality before purification. Salt water is off limits. The salt content in seawater is high enough that it causes further dehydration, hallucinations, and eventually death. As for fresh water, follow the terrain downhill until you see creeks, rivers, ponds, or lakes. Running water is always your best bet as standing water allows for more growth of pathogens. Of course, springs and runoff from rain are your cleanest sources of water. In some cases, you can even drink these without purification. However, most water needs to be purified. If you do not have a body of water, you can dig a well at a low spot or dry creek bed where water may have once been. There are two primary ways that you can purify water. You can eliminate the bacteria and parasites in the water, and you can filter out any dirt or sediment in the water. When pulling water from the wilderness, it is a good idea to do both. In this article, we are going to cover methods to accomplish both tasks. Understand that you can pick one method if needed, but your best bet is to combine these methods to get your water as clean as possible. Boiling is one of the oldest and most effective ways to kill pathogens in drinking water. Bacteria and parasites cannot stand the heat of boiling water, so even bringing water to a roaring boil for a few moments can make it safe to drink. I try to boil my water whenever possible, but there are disadvantages to this water purification method. One is that you must have some kind of container for your water. It works great if you have a pot or coconut shell, but not so great otherwise. Another issue is that you must have fire to boil your water. While sometimes fire comes easy in a wilderness survival scenario, often you will not have the tools needed to get a fire going quickly. Even if you do have fire and a container, your container may not be able to withstand the heat of the fire. It could melt or even catch fire. One way to get around this issue is the hot rock method. Put dry stones in the fire and let them get red hot. Then move them to your container filled with water. The water will boil from contact with the rocks, but the container will not catch fire or melt. Never put wet rocks in a fire as they will explode as steam tries to escape. Another option is the suspension method. If you have a plastic bottle that cannot be set in the fire, you will need to suspend it over the fire. Build a tripod by lashing three sticks together all being about three feet long. Then use cordage to suspend the bottle from the center of the tripod over the center of the fire. You want the flames of the fire to reach just short of the bottom of the bottle. It will start to melt and change shape but will not let the water spill into the fire. Be sure to keep the lid off of your bottle until it cools. Filtering is another very effective way to purify water. The main function of filtering is to pull out dirt and debris that can be found in water sources. However, the use of charcoal in many filters will also draw out much of the toxin and pathogen content as well. This is why the quality of your filter is vital to your survival. We can start with the best and easiest way to filter your water. 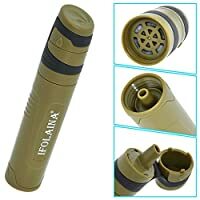 That is to use a quality survival water filtering system. 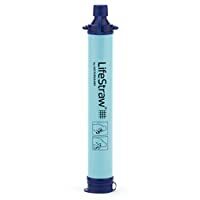 The smallest and most portable options are straw-style filters. These are small enough to fit in your pocket, and most will eliminate 99.999% of pathogens in drinking water. However, they require you to either have a container for your water or to get down on the ground to lie on your belly and drink. My personal favorite option is a filter bottle. 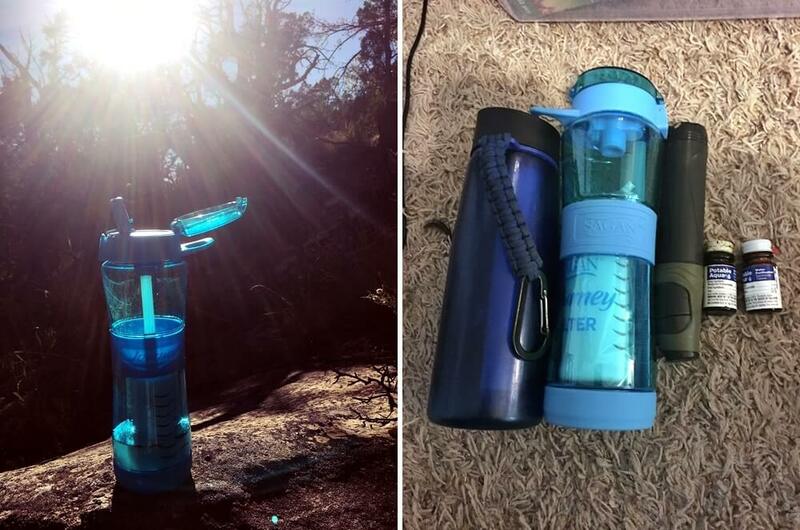 These bottles allow you to carry water with you, and they filter just as effectively as a straw filter. 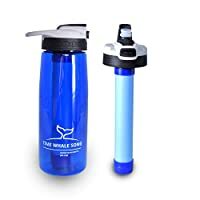 You can use them in your EDC (everyday carry kit) as they look much like any other water bottle and can be taken to work or to the gym. They often have a rubber mouthpiece that is more forgiving than the mouthpiece on a straw filter. I like to fill mine with tap water before going on a hike and hook it on my belt. Then I know I can stop at any water source to refill once the tap water is gone. There are also large gravity filters that are built for large camps or groups. 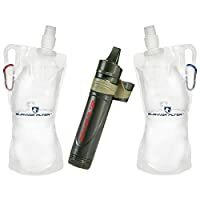 These have a big water bladder that holds several gallons above a tube and a filter. Gravity will pull the water down the tube and force it through the filter. They are not nearly as portable as the other options. 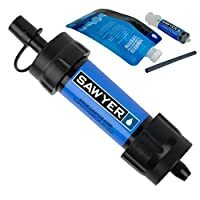 Finally, you can make your own filter by layering gravel, sand, cloth, and charcoal in a container and running your water through the filter. This should draw out debris and most pathogens in the water. 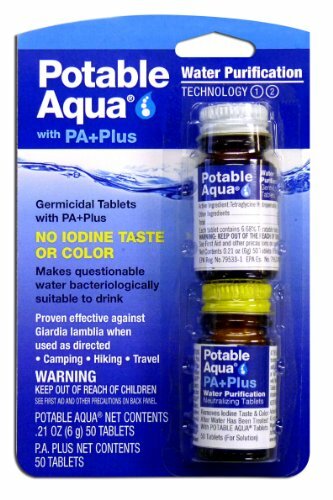 Another one of my favorite methods of water purification is using iodine tablets. These tiny pills fit in a small vial that is barely noticeable in your pocket. One vial carries enough tablets to purify dozens of gallons of water. Be aware that using chemicals to purify water over long periods of time is a bad idea, but for surviving a few weeks in the wild it is fine. The two major downsides to water purification tablets are simple. You need a container, and you need some time. Iodine tablets take about 35 minutes to effectively purify water. There have been times I have been in the wilderness and needed to drink water at that moment. This method is not for those times. Once you have a routine established, you can plan ahead and use your tablets to purify water well before it will be needed. You can also use a few drops of liquid iodine or bleach to accomplish the same thing, but the liquid is tougher to transport. Believe it or not, simple ultraviolet light from the sun can purify water. Over time, ultraviolet light will kill bacteria and parasites. However, you must complete the process the correct way for this to work. Your water must be in clear bottles. Any green or brown coloring will hurt the process. The labels and glue should be removed from the sides. Plastic bottles work better than glass because the light can more easily reach the water. Cloudy days will not work. You need to set your bottles of water out in full sunlight. Find a spot where they will not be disturbed and lay them down sideways so there is maximum surface area exposed to the light. They will need to sit in the sun for at least six hours, but the longer the better. If you can combine ultraviolet water purification with another purification method, it is a good idea. This method can be challenging. There are times that you may not have a fire or a container to purify your water. In this case, a seep well may be your only option. With this method, you are using the earth to filter the water from your source. You will want to move a few feet from the edge of the water and then dig a hole deep enough that it dips below the surface level of the water source. Gradually, you should see water start seeping into the bottom of the hole. If it is coming in quickly, you need to move your hole further from the water source. It needs to slowly be filtered through the soil. Once the hole has filled with water, give it about 30 minutes for the sediment to settle. You may have to skim some debris off of the surface, but then you will be ready to drink. Be aware that this is a last resort and only filters some of the impurities from the drinking water. I can tell you from personal experience that water is vital for wilderness survival. Last fall I completed my first high desert challenge. After dropping into a canyon and hiking several miles, the sun was drawing all of the water out of my body. I searched for water for days, and finally, I decided I needed to extract myself or I was not going to survive. I started hiking back out and had to stop every 100 yards or so to rest and keep from passing out. Eventually, I made it to the edge of the canyon and had to decide if I was going to lie down and die or pull myself out with the heavy pack on my back. I had not had a drop of water since the day before. I gathered every ounce of energy I had and clawed my way up the rock face. Since then, I have not taken drinking water for granted. Of course, finding water is only half of the battle. You need to take the time to know these water purification methods and have the supplies to make them happen. Practice when you go hiking and camping, and be ready when your life depends upon it.